By choosing Manx Independent, you have selected one of the Isle of Man's most respected transport and logistics organisations that is committed to the safe and timely movement of cargo by Road, Air and Sea. We offer shipping services for many National and International clients and handle most types of goods, including express parcels, foodstuffs, automotive, industrial and construction equipment, home furnishings, electrical and audio/visual products, and bulk products. 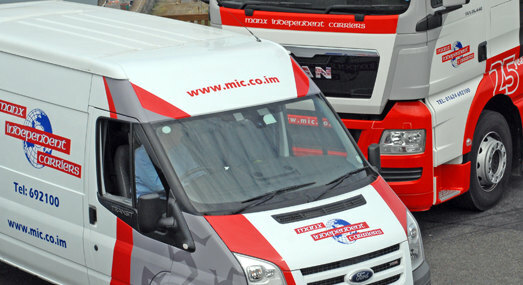 The Company recognised the importance and need for an effective and timely delivery service for the Isle of Man, we combined our knowledge and expertise to create the Island's largest Transport and Distribution Company. The desire to provide the best service standards possible has continued throughout the life span of the company and, as the needs of the Island have changed over the years, we have diversified our services accordingly. A key benefit of the service lies in offering a consolidation and distribution service to markets where low volumes of goods are required on a regular basis. Manx Independent Carriers believe customer care is paramount and consults with its customers on an on going basis to ensure that the company is best placed to cater for current and future requirements of our customers. The Manx Independent support team is here to help you. If you would like to find out more about what MIC could do for you, or would like to start to take advantage of our unique range of services, please contact us.